The term 'Black Beauty', as it applies to antique snare drums, is typically attached to the blackened shell, ornately engraved snare drums of the 1920s and 1930s manufactured by Ludwig & Ludwig of Chicago. Hardware on these drums, when not actually gold plated which is rare, was commonly lacquered and or plated to achieve a color similar to the metal exposed by the engraving on the blackened shell. The end result is an instrument with a striking appearance. Originally catalogued as the "DeLuxe Model", Ludwig's engraved drums date as early as the late 1910s. It wasn't until 1931 or 1932 that Ludwig adopted the name 'Black Beauty'. Leedy of Indianapolis of course had the "Black Elite" and Duplex of St. Louis made a very small number of "Black Jewels", but it was Ludwig's cross town rival Slingerland with their engraved Artist model who supposedly first used the moniker 'Black Beauty' to describe an engraved, blackened metal shell drum in their advertising around 1928. But in 1925, several years before Slingerland began using the term, Boston's George B. Stone & Son described in Catalog K (see page 27) the inclusion of a black Separate Tension Drum which they called a Black Beauty. 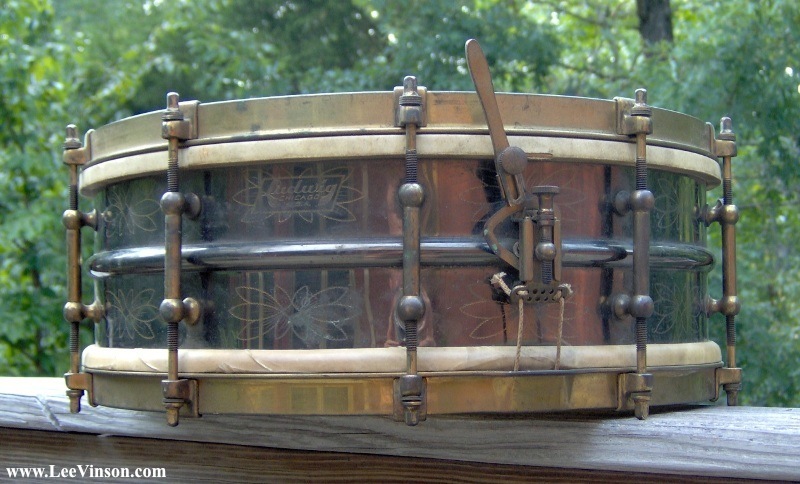 So while no snare drums built by any of the early 20th century Boston makers could truly match Ludwig, Leedy, or Slingerland's metal shell mastery, there are examples of New England-made drums which aimed to emulate the brass against black appearance of such drums. This George B. Stone & Son Master-Model drum dates from the late 1920s or early 1930s by which time the company was fading from its prime. For better or worse, this drum was subjected to a full restoration at the hands of a previous owner. That much is certain as it arrived with the receipts for the replating work tucked away into the drum case. Faux gold plating, or "Knobby Gold" finish as Stone referred to it in their catalogs, was indeed a factory option meaning that the brass hardware against the black lacquered three ply maple shell seen here may very well be how this instrument looked straight from Stone's shop on Hanover Street. Short of a few All-Metal Master-Models, Stone was never much for making their own metal shell drums. Of the small number of brass shell drums they distributed and the much smaller number of aluminum shell drums they built out, none are known to have been engraved. So this is as close as Stone would come to producing their own 'black beauty'. Nokes & Nicolai also apparently offered a brass over black snare drum. Their All Metal Drums were built around a thick single sheet of aluminum riveted together at the seem. Most shells were buffed and lacquered leaving them to shine in a polished silver color. This particular example however is dressed in black enamel so that the faux gold hardware stands out nicely. It is possible that these finishing touches could have been later modifications, but a close inspection of the drum is inconclusive. Whatever the case, factory original or aftermarket, the drum has not been touched in a very long time so that a nice patina is in place which suits the drum well considering its age. And assuming that the brass over black configuration is original, it is a clear attempt by Nokes & Nicolai to stack up against the black beauties of the world. 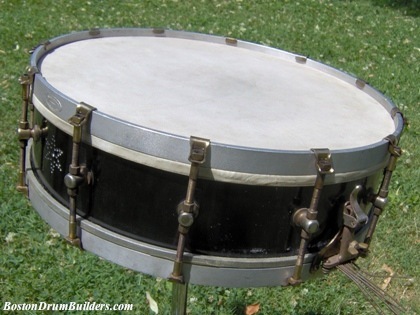 It's worth mentioning that an engraved, metal shell Stromberg snare drum does supposedly exist. But despite the good word of a highly reputable collector, the drum hasn't surfaced. So for now, the two drums pictured here are the closest we have to what most would think of as a Boston Black Beauty. 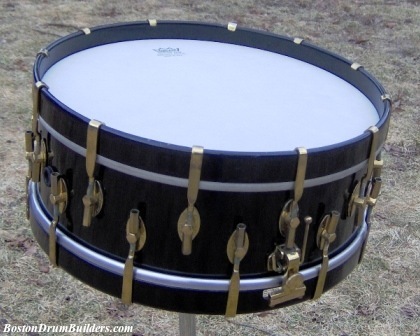 Do you have a drum built by one of the early 20th century Boston makers? I'd love to hear from you! Feel free to send Lee an email any time at lee@vinson.net.